I think I can breathe again. Goodness knows we all need a bit of quiet and time of reflection; what better way to ring in the new? It was a good year here at the ‘Toad! Business gained traction and I learned new skills, gained many happy customers and found time to enjoy my day-job and family as well. *Note: pattern links are not included. Many of my items are reverse-engineered, meaning I looked at a picture and made up the pattern myself. Photo captions include the necessary key words to Google a similar pattern, if you would like to make your own! And another lion, so cute! Well, that’s a wrap, folks! How nice to see the year in review, as I often feel I haven’t accomplished much crochet time. I’d best get to work, as I have more monkeys to make! Hello, Hello and Happy Tuesday! Barring the holidays, for us this is the busiest week of the year. Local colleges finish up (making all my student and teacher friends a bit crazy), we have our dance recitals, final church and music programs for the school year…and this year a class trip to the ZOO with grandma, grandpa AND daddy, oh, joy! The eldest can drive herself to rehearsals. The middles can walk to their concert, and choose their own theme outfits, with minimal assistance– it’s a 70’s tribute, I understand. I just need to make the meals and keep the littles out of trouble. So far, so good. I am busy on a new project this week– has there been a week yet that I am not!?! 😉 My sweet neighbor is having her second baby boy. 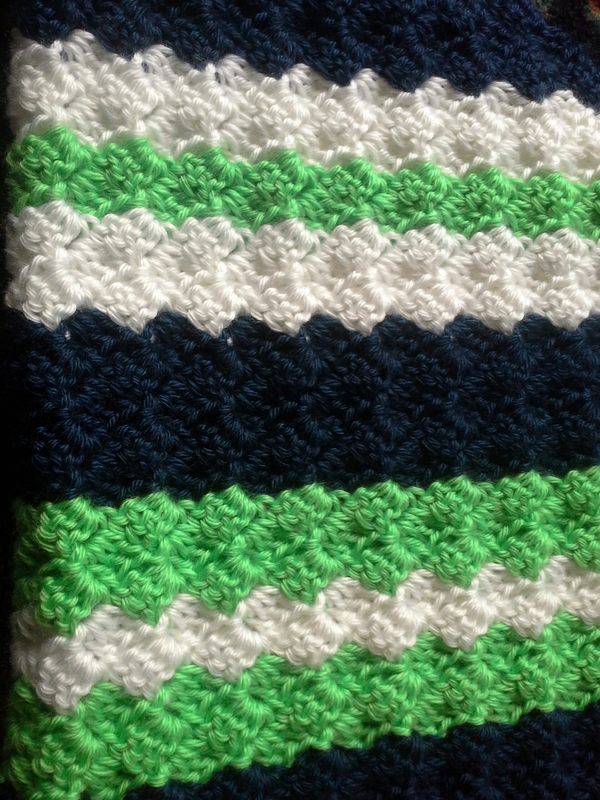 Now a new baby is coming to the same nursery, and big brother has been moved out to his own room…so the same colors, and theme, but certainly we couldn’t do the same blanket! 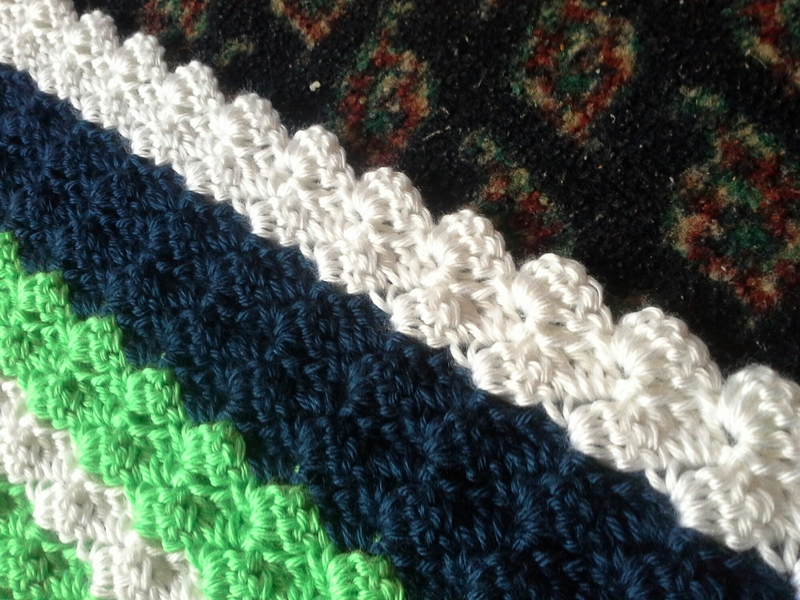 It’s been a bit since I did a corner-to-corner, and I have seen some LOVELY striping patterns lately. I like the random, varying-width look, but am a bit short on time for dreaming and designing, so stuck with something a little more predictable. 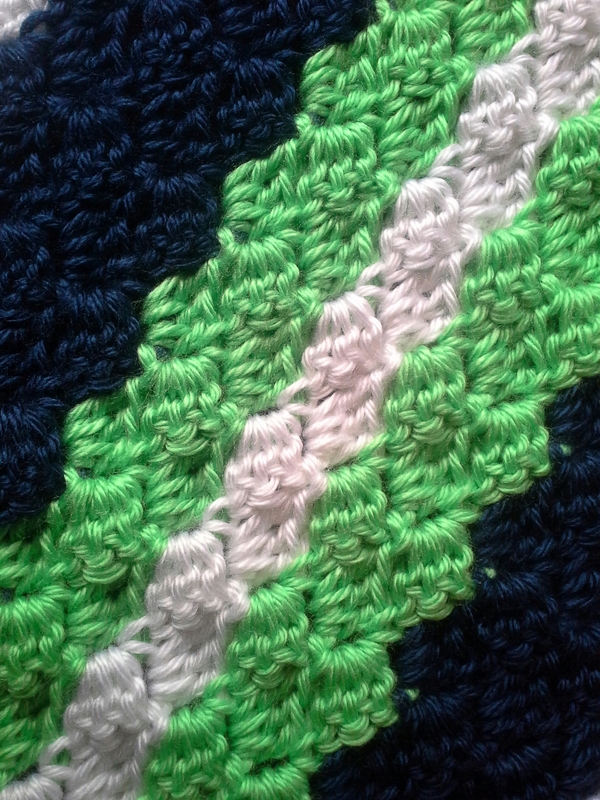 Lovely limey green, navy and white. It’s a bit nautical, and very BOY. 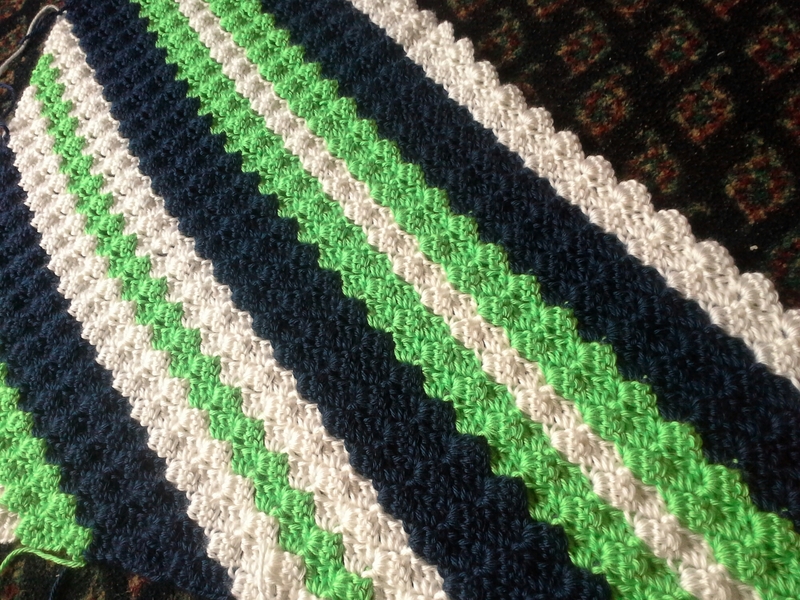 Caron Simply Soft and my favorite 5mm H hook give it a nice soft feel. 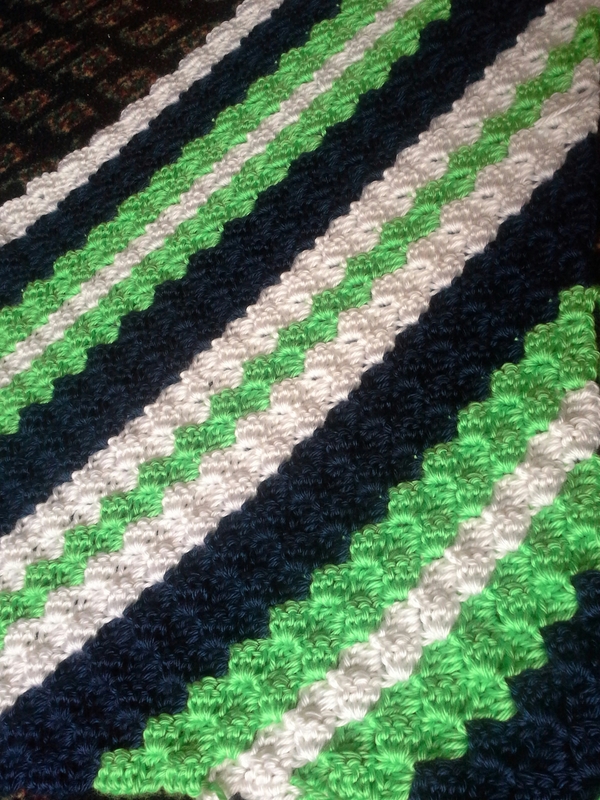 Row counts are 5 rows of navy, then 4-2-4 of green/white/green or white/green/white, alternating. Marvelous effect! Such pretty striping. And it worked up rather quickly. Just a couple hours to go. 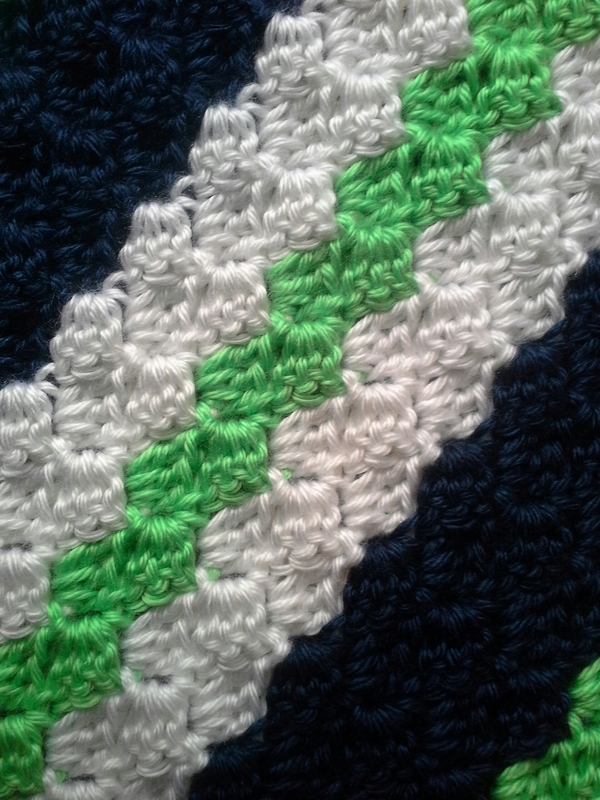 I’m thinking of edging in a few rows of single crochet stripes. Or perhaps no border at all. C2C is one of the few afghans that can look better without a border.